Do you enjoy being active with your Samoyed??? 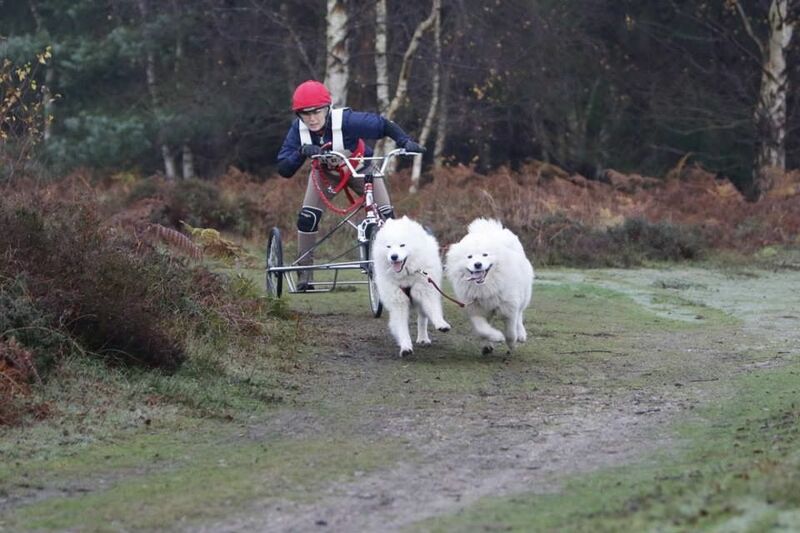 There are other categories available in the US such as Skijoring and herding which we are currently unable to offer but would like to work towards those being available to UK Samoyed owners as well. Working Samoyed title (WS) – this entails obtaining 1000 points from any one or a combination of working categories, which are set out above. Working Samoyed Excellent title (WSX) – this entails obtaining at least 2000 points in any one or a combination of the above recognised working categories. Master Working Samoyed title (WSXM) – whereby 5000 points must be earned in at least 4 of the recognised working categories above. The dog must have earned a minimum of 200 points in each of the 4 categories. So how do you accumulate points and how does this work?? For the competitive racing the Samoyed must compete in races which the rules are recognised as compatible with the SCA requirements i.e. the race must be run under ISDRA or ISDRA compatible rules. Currently in the UK the organisations which run races which are compatible are SHCGB, SDAS and Wyedean Mushing. We are working with the SCA on establishing whether other organisations rules meet the requirements and will add them on here when they do. A form must be signed by a race official noting your participation and points are collected for each race in accordance with the detailed document. You will need to ensure that you get Form B for each race by the Race Organiser. Form A is also required to be completed for your dog. Links to both Form A and Form B can be found HERE.Form A SCA race and Form B SCA Race Certification form. The Samoyed must pull a minimum of 10 to 12 times its own weight to earn points. The weight pull must be sanctioned by ISDRA, the International Weight pull Association or the Alaskan Malamute Club UK. The cart must have 4 pneumatic tyres of the same pressure. Points are earned by calculating the percentage of body weight the dog pulls in each competition. Again records need to be retained for each event and the relevant Form can be found HERE Weight pull (1) For more information please see menu to the right and click weight pull.